We had a visitor when we got home. Patti called me at work and said that she stepped over a rattlesnake on our back porch as she was going into the house, and was wondering if I could come and dispatch him to another plain of existence. I on the other hand felt that I could catch him and put him where he could be of benefit. Somewhere that he can catch mice, crickets, and other bugs. When I got home I moved a few things on our porch and found him coiled up behind our couch. Poor guy, looked scared... I got a 52 oz glass from the truck stop and coaxed him into it, shut the lid tight, and took him into the desert. Good for the snake, good for me, good for Patti and Corky. 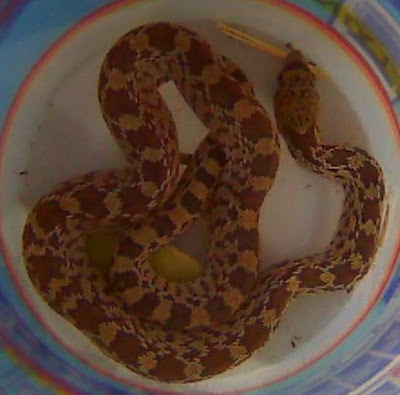 As it turns out, he was a Pituophis catenifer or Bull Snake. He is non venomous relative of the Gopher Snake and harmless to people. He tries to act like a rattler by shaking his tail and striking (a behavior that nearly got him killed) to ward off predators. I was asking for sticks and buckets to get him, Patti kept bringing me shovels and hoes. I guess she is in favor of other plain of existence idea. don'cha just love livin' in the desert? I know why they call it a "Bull" snake. They shake their tail like a rattler and pretend to be what they are not. So in other words they are full of "BULL".